The 2013 Washington Women in Public Relations Emerging Leaders Awards Committee is now accepting nominations for this year’s young, rising PR stars in the D.C. area. If you know female PR professionals in the D.C. area between the ages of 23-30 who have demonstrated outstanding leadership skills and the potential to have a significant impact on the industry in the future, don’t miss this chance to nominate them (or yourself). 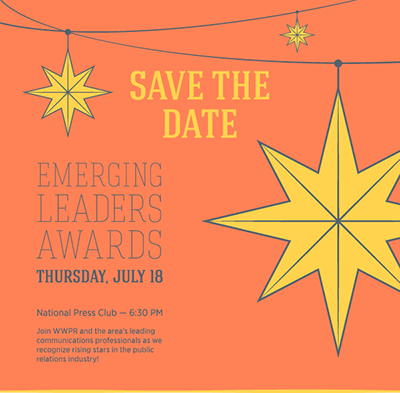 Nomination instructions and more information can be found at http://wwpr.org/events/emerging-leaders-awards/. The deadline for submissions is May 31. I thoroughly enjoyed serving as a judge for the 2012 Emerging Leaders Awards and can’t wait to meet this year’s finalists! Be sure to save the date on your calendar for the event on Thursday, July 18, 6:30 PM at the National Press Club. Hope to see you there! This entry was posted in Around Town, PRofessional Solutions News, Upcoming Events, WWPR and tagged Washington Women in Public Relations, WWPR, WWPR Emerging Leaders Awards. Bookmark the permalink.